The Meadowlands Commission's free Third-Tuesday nature walk this month is at the legendary Harrier Meadow. 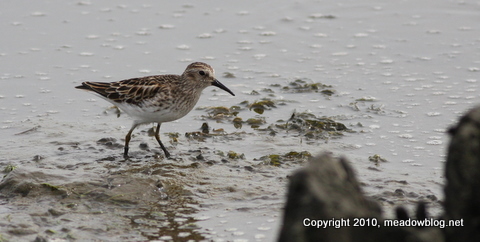 The timing (and tide) should be right to see migrating shorebirds and a raptor or two. The walk, run in association with the Bergen County Audubon Society, runs from 10 a.m. to noon. Because the site is usually closed to the public, you will need to sign a standard liability release. Download it here: Download HARRIER Release. Full listing, with rsvp information, follows. John V. Soltes, editor-in-chief of The Leader, did an offbeat front-page story this week on "lucky" birding finds in the Meadowlands. The story quotes the NJMC's Jim Wright, who keeps this blog, and NJMC naturalist Gabrielle Bennett-Meany. 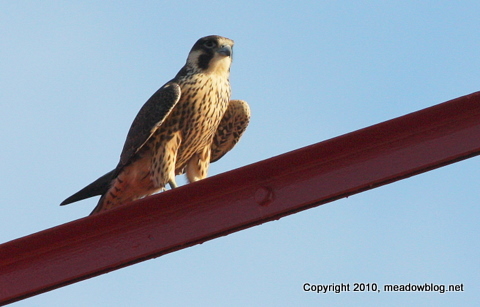 Some nice pix from the blog (including the one above of a young Peregrine) provided the visuals. Link is here. 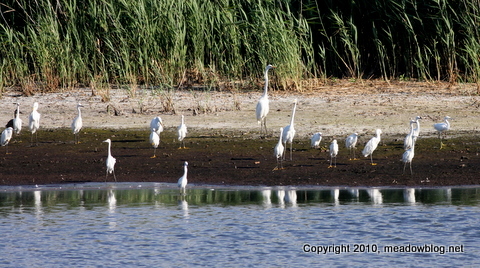 The Meadowlands is a prime destination for foraging egrets that have colonized South Brother Isand in the East River. That fact was underscored late last month when Lorraine Novinski was taking one of her regular bird counts for the Harbor Herons survey. Lorraine noted a Snowy Egret that had been banded on South Brother. When NYC Audubon heard of the sighting, it sent reseracher Liz Craig (above) to the site to see if she could find the banded Snowy as well. 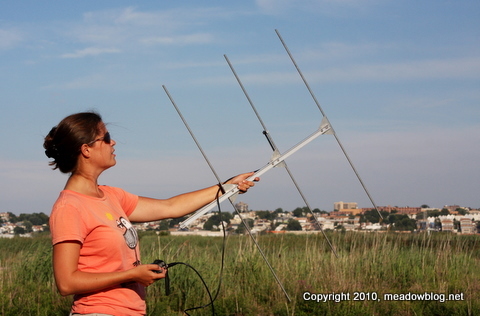 She did not see the Snowy, but she held up a large antenna and picked up the signal from a Great Egret that had been equipped with miniature radio transmitter at South Brother Island in June.